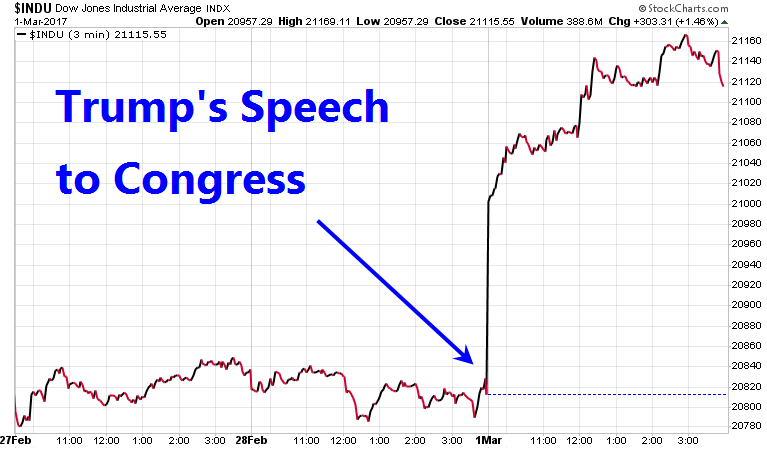 The Dow has now broken above 21,000 to a new all-time high following Trump's Joint Address to Congress. We take a look at recent US manufacturing data, monetary policy, unemployment, and consumer confidence to make sense of it all. US GDP for the fourth quarter of 2016 came in at just under 2% but, looking forward, small business optimism is surging higher after Trump's win last November. Another area that is surging is US manufacturing, which is now showing a clear recovery after falling to 2008-2009 levels last year. 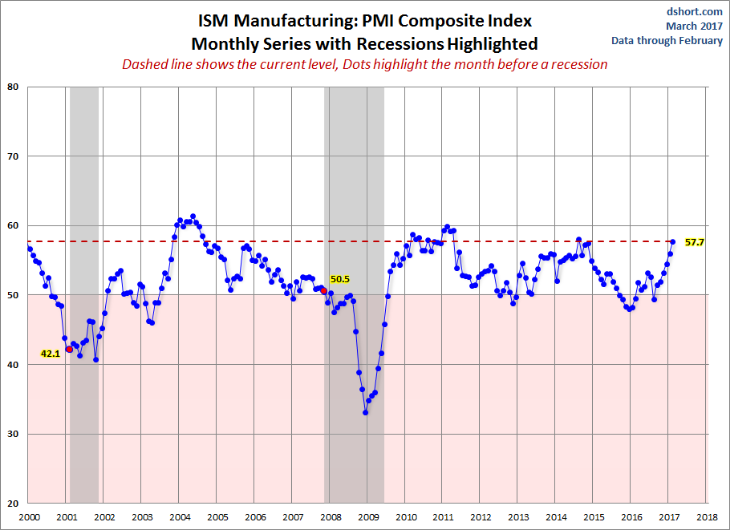 This is certainly moving in a positive direction and shows that risks of a major economic slowdown or recession have eased. While there is still some uncertainty on whether President Trump will follow through on his many promises, his much-anticipated Joint Speech to Congress on Tuesday was very well accepted by investors as the Dow Jones Industrial Average surged over 300 points above 21,000 on Wednesday. Trump reiterated his commitment to lower taxes and government regulations, which, among many other things, still seems to resonate quite strongly with small businesses and corporations. Can he deliver? That continues to be the biggest question he faces going forward. He'll have to act quickly before the "honeymoon phase" begins to fade in coming months. The Federal Reserve tends to hike rates as the economy overheats and inflationary pressures build. 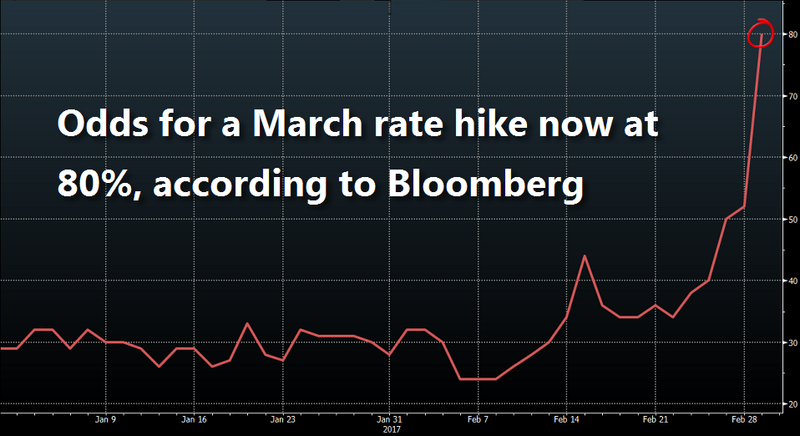 Market participants now expect about 80% odds for a quarter-point Fed rate hike in March (see below), bringing the Federal funds rate to a target range of 0.75-1.00%, which is still quite low by historical standards. If the economy continues to improve and inflationary pressures build, the market will have to contend with an increasingly restrictive monetary policy. US jobless claims are a widely-watched real-time indicator for the health of the labor market and are used as a proxy for layoffs. Currently, US jobless claims remain near multi-decade lows, indicating that layoffs are in decline with little risks coming from the US labor market at present. 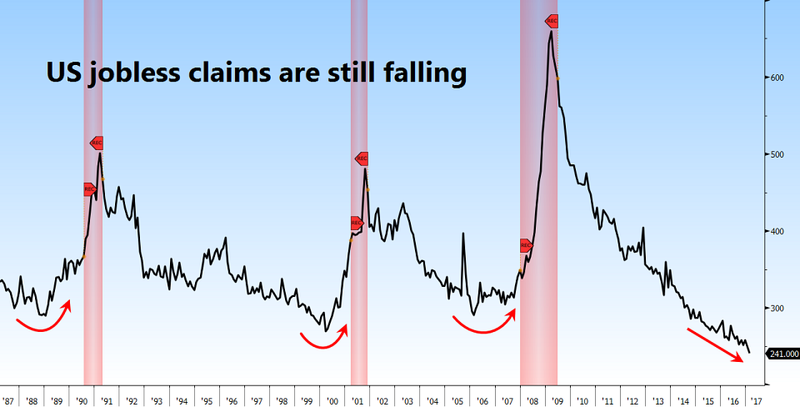 As you can see from the following chart, jobless claims tend to be a fairly reliable leading indicator for recession. If this data starts to trend upwards, we expect the 8-year bull market to turn as well. Investor and consumer optimism are arguably the drivers of market fluctuations and when investors are too fearful or too greedy, a mean reversion or “reality check” is highly probable. Right now, investors and consumers are quite confident about current conditions and, according to data from Bespoke Research, consumer confidence is now at new cycle highs, matching levels not seen since the 2007 market peak. In closing: The US economy is showing profound resilience given how bleak it looked about a year ago. How long can this persist? Valuations appear to be quite stretched and monetary policy will move from being a tailwind to a headwind if inflation pressures build. Many suggest that we are at the beginning-of-the-end or what’s commonly referred to as the final phase of the bull market. But from what we’ve learned this year… anything could happen. The market’s biggest role at any given time is to make the “expert” look as foolish as possible. The question then becomes, who has it wrong?